Why is it that all participants at leadership workshops agree and understand what the right attitudes and behaviours are BUT when they return to the workplace, they are unable to practise what they have learned? Many tell me, “Hey, coach, let’s be realistic! What we’ve learned is only applicable in an ideal world. If only you were in my shoes, then you’d understand that what you’ve told us makes no practical sense in my situation! When I reflect on the participants’ predicament, one word comes to mind: Egotism. the practice of talking and thinking about oneself excessively because of an undue sense of self-importance. They were basically dealing with leaders who were filled with egotism. Their very own leaders were the stumbling block to their attempts at resolving workplace challenges. Whether in middle management or top management, unbridled personal egotism blindsides a leader to the realities around him. Over time, he comes to live in a world of his own imagination; and because he sincerely believes he can do no wrong, he becomes a menace to those who have to work under his leadership. The egotist may walk, talk and smile politely like everyone else, but beneath the decent demeanour, he is impaired by his narcissism. The egotist is unwilling to accept information or knowledge that is contrary to his preconceived notions, especially when it conflicts with the image he holds of himself in his own mind. 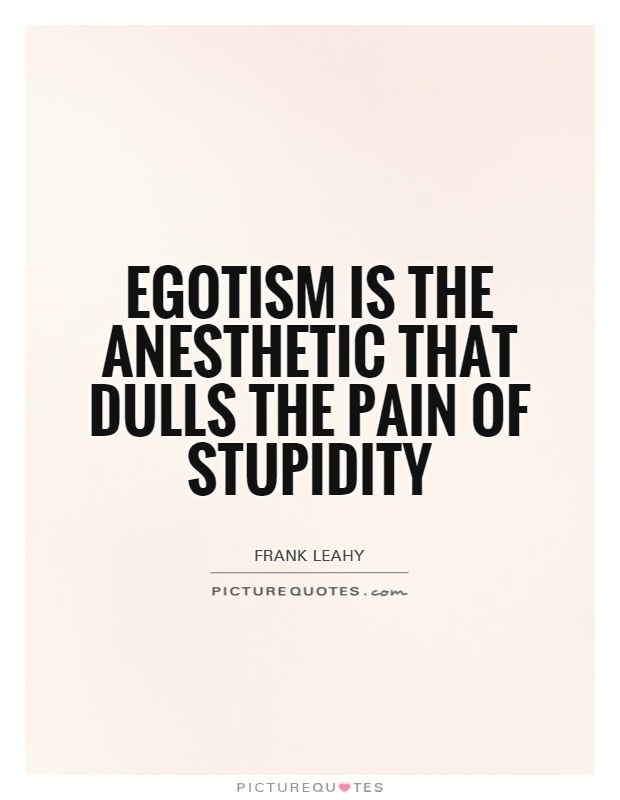 Precisely, because egotism is a potent anaesthetic that dulls the pain of the leader’s stupidity. Unfortunately his subordinates have to bear the brunt of that kind stupidity. On an extreme level, we have the supreme egotist. In corporate life, the supreme egotist believes that he is smarter than all his colleagues and he should be in control while everyone else is there to serve him and his agenda. I’m sure you can think of political leaders that fit the bill, but for many of us, we need to look no further than our own corporate corridors to find egotists occupying senior leadership positions. At many board meetings, I’ve witnessed how everybody automatically rose to their feet when the chairman walked in. When I approached them in private to enquire why they did so, they said it was the norm and a sign of respect to the chairman; but upon further research, I often discovered that it was the chairman himself who had instructed his secretary to instill the practice. There are also egotists who delight in seeking greater public recognition in order to stand out among other corporate leaders. Perhaps the business landscape is becoming increasingly competitive, and they feel the need to rub shoulders with more bigwigs. So they devote inordinate amounts of their working hours to social activities outside the company. Meanwhile, they delegate so-called routine responsibilities to their subordinates. Their egos have made them blind to the reality that their first and primary responsibility should be to the company that signs their pay cheques. It doesn’t take long for such an attitude to slide its way down through the organizational hierarchy to breed the “little Napoleon” syndrome. This kind of egotism easily demeans and destroys the collective effort of a company’s management. Eventually the staff becomes wary of conveying any kind of bad news to an egotistic boss as he is likely to shoot the messenger. The tragic result is that any real, open communication in the organization gets severely compromised with potentially far-reaching repercussions. When you have leaders like these, then you know why Leadership is No. 1 Human Capital Challenge today.